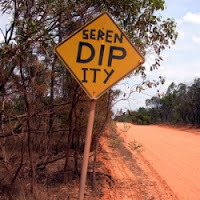 Walsine Pierce: SERENDIPITY: Today Your Day? AND FINDING A FARMER'S DAUGHTER - Julius Comroe, Jr. SHALLOW MEN BELIEVE IN LUCK OR IN CIRCUMSTANCES. Adventure Cycling mentioned "Serendipity" in their current newsletter. 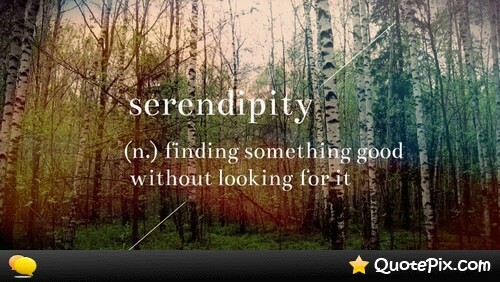 It is a word I have always liked. The word means "the gift of being able to make delightful discoveries by pure accident". I thought that would make a good blog and started to list my serendipitous experiences. I came up with a whole sheet of such moments in a couple minutes. I have been so blessed. 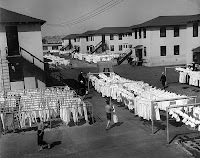 I thought about being the 7th tallest man in my company when I went to Navy boot camp. The tallest man was made Recruit Company Commander, the next 6 tallest were made Recruit Petty Officers. My 6' 2" made me the 7th tallest man, I was Squad Leader of the 6th Squad, 2nd Platoon, in charge of 16 men. Serendipity! That little "Crow with a single chevron" meant I didn't have to do a lot of miserable work the sixteen men in my squad had to undergo. I didn't do any kitchen duty, stand watch over garbage cans or even undergo fire fighting. I still have that little arm patch. Serendipity! Uh, Yes! We all did our own laundry and "tied" it to the clothes line with a square knot with no bitter ends. It was the Navy and it was boot camp! GO NAVY! I recalled my first trip to Japan aboard the USS Yuma ATF94. 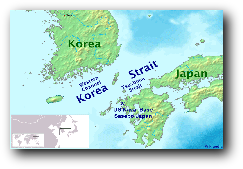 In Sasebo, across the strait from Korea, we had just entered the Korean War. As ship's radioman, I couldn't go ashore the first night. The guys coming back from liberty told huge whoppers about there being dozen's of the most beautiful women in the world waiting at the gate, all shouting, "Joe, take me". When I went ashore the next night it was just as they had said. The money exchange was 360 yen to the dollar and regardless of what you bought, you couldn't spend more than three dollars. Truly, a serendipitous moment! my Japanese friends who have read 64 of my blogs so far this month. Six years ago I had gone down to southern Ohio to pick up something my nephew, Jim, had purchased for me. 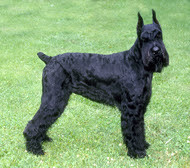 In a pen, at his house was a beautiful, black Giant Schnauzer. My great Airedale, Jake, had just died and I told Jim that I had decided to get a Giant Schnauzer, a more aggressive guard dog. Jim said "Take that one, I'll give him to you". He had paid $800 for him as a pup. I brought him home, obedience trained him, renamed him Gunner and he is just the best guard dog. Serendipity! I had appointments at the same time in two different places. In a hurry to get to the second appointment, a birthday party, I took an unfamiliar shortcut. On the shortcut I saw what I thought was the most beautiful little sailboat for sale. 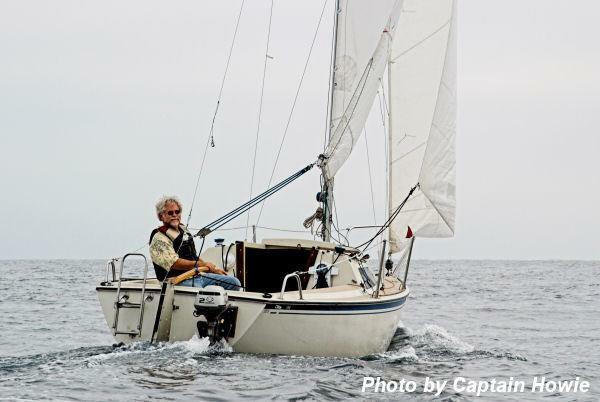 Boat, motor, sails and trailer for $1,500. Two bunks and a porta-potty in a snug cabin, I fell in love with her instantly. Serendipity! I've upgraded to a tandem wheel trailer with surge brakes and have plans to replace the little 3HP motor with a 4 cycle, 8HP motor with a generator. I love my s/v Christy Anne and plan to sail her on the Ohio River several weeks this year.. The kitchen in our, now 109-year-old, rental property my wife and I had decided to move into ourselves, had a drop ceiling. My oldest son, Mark, and his wife, Mary Kay, had asked if I'd come to Mansfield to look at some homes they were considering buying. Of course, I did, and saw a kitchen in a model home with the most beautifully beamed kitchen. I came home, removed the dropped ceiling and built the same beams in my kitchen. Everyone comments on their beauty. Serendipity! 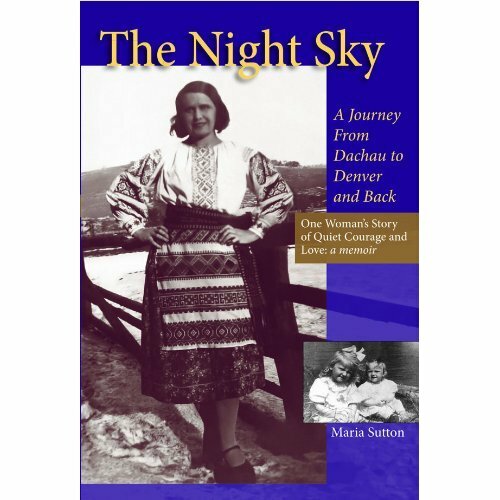 Mrs. Sutton was a survivor of a Nazi concentration camp. Her book, "The Night Sky: A Journey From Dachau to Denver and Back" was so interesting. She came to this country as a child, had absolutely nothing, didn't speak the language and lived in a shack in the Colorado mountains. She obtained a good education and had an important U. S. Government position. We have exchanged emails. I have visited the Dachau Concentration Camp. Serendipity! I was getting nervous for a couple of minutes thinking you were going to leave me out of this blog entry! Thanks for mentioning me as a "serendipity." I also think of it as a "God wink." 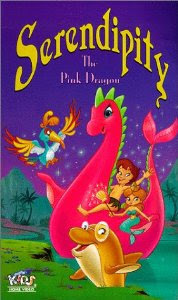 He knew you and I would hit it off great, and He was right!